Mother nature creates some wonderful and powerful things. International Gaming Technology (IGT) has joined forces with Mother Nature to bring you White Orchid. The beautifully named slot machine brings you unprecedented levels of action with 40 pay lines, plus 1024 additional ways to win, with the use of multi-way technology. If you bet 40 credits to cover 40 pay lines you will gain 1024 additional ways to win for only 40 credits more. With 20 independent wheels you can win some pretty big numbers for matching groups of symbols in this magnificent game. If you get two or more bonus symbols you will be introduced to the superb White Falls Free Spins Bonus screen. You will be able to enjoy anywhere up to 20 free spins in this bonus section with the added power of being able to activate the bonus multiple times. You can find an Advanced Video Platform (AVP) version of this game, as well as an Enhanced Video version in any online casino UK. If you are lucky enough to find the Enhanced Video version of White Orchid the graphics will simply stun you. They are some of the best graphics in the IGT arsenal today. The game is a little flowery and may be ideally suited to the female gamblers but who cares about flowers when the breeze is shooting you lines of credits? 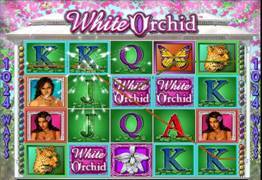 The maximum bet you could make whilst playing White Orchid is 1,600 credits and the top prize is 5,000 credits. If stunning graphics and constant action is your thing then be one with nature and play The White Orchid.